Microsoft has introduced a variety of Windows 10 keyboard shortcuts to navigate between new features, like,snap (which lets you “snap” desktop windows to the left or right side of your screen, taking up either a half or a quarter of your display) virtual desktops, and even activate the new Cortana digital assistant. All the new important additions use the Windows key, so they’re easy to activate. Most of us are aware of taking advantage of a new interface and amazing features of Windows 10. But there are dozens of Microsoft Product users that have upgraded to windows 10 but still do not know about its hidden keyboard shortcuts and tweaks. Winkey + Space = Switch input language and keyboard. Winkey + Plus = zoom in using the Magnifier utility. Winkey + Minus = zoom out using the Magnifier utility. Winkey +, = temporarily hide apps to briefly show the desktop. Winkey + G = Activates the new Xbox game bar to let you record games or take screenshots. 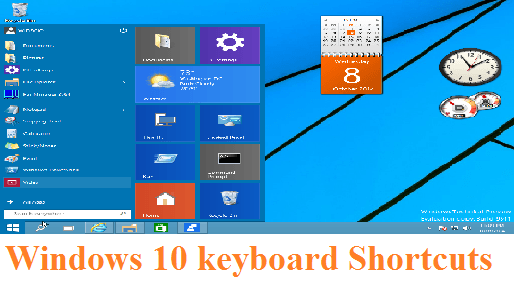 Hope so you will get something new with these windows 10 keyboard shortcuts.